You might remember back in March we joined forces with WellFest and The Happy Gut Clinic to bring one lucky winner a six week ‘Eat Yourself Happy’ course, along with unlimited Sadie’s Kitchen Comforting Chicken Bone Broth. And because we were feeling extra generous, our lucky winner got be bring a friend along for the journey! We were delighted when the very lovely Ciara Hickey from @LegallyFit_ was chosen as the winner. With a keen interest in health and fitness, we knew she would grab this opportunity with both hands. And we were right! Read on to hear how she got on. Over the past few years, I have developed a keen interest in fitness. However, with college and other stressful periods of life, I found that my nutrition often fell by the wayside. After allowing this to occur for too many years and as my IBS increased in severity, I decided it was time to take control of my health, as well as my fitness. This is not as easy as you might imagine! With the internet and social media, there is so much information and it can often be difficult to filter what is genuine advice. I was delighted to win the amazing prize of a six week ‘Eat Yourself Happy Course’ with the amazing women at the Happy Gut Clinic, aided by heaps of Comforting Bone Broth from Sadie’s Kitchen. It was the first opportunity I have had to work one on one with a qualified nutritionist to really understand what is going on with the body. It also was just what I needed as an IBS sufferer, as it was focusing on the gut which is where my problems arose. The first three weeks have focused on the idea of healing the gut. After so many years of mediocre nutrition and, as most college students would understand, a bit too much drinking, I was excited to get started healing my body. As this gut healing did include removing some foods from my diet for a certain period, it also meant that I got to be creative in the kitchen – something which I love to do. I became more mindful of what I was eating and how I was fueling my body. Allowing myself to focus on food was so therapeutic. During my first three weeks of the course, I was faced with an extremely stressful week, including receiving some of the most important exam results of my career. Often when I am faced with such stress my nutrition goes out the window. 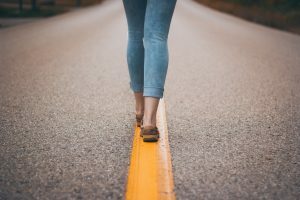 This time, however, was different, with goals to focus on and guidance at hand I felt more in control. I learnt many amazing things over the past three weeks and can already feel an improvement, especially, with my IBS. I have learnt how to more conscious of seasonal eating, so not only am I eating fruit and veg when they are at their best, but also finding out how to source them when they are at their cheapest. How to take care of my immune system, especially when I’m going through stressful periods, and also how to nourish my body properly for the amount of exercise that my body endures in the gym, and through my active lifestyle. 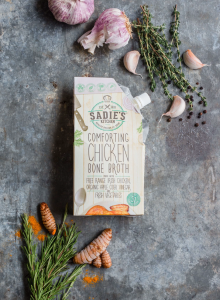 I am so looking forward to the final three weeks of the clinic and to try out more amazing recipes with the Sadie Kitchen’s delicious chicken bone broth.